The team is proud to announce the release of Linux Mint 7 x64 Gloria RC1. 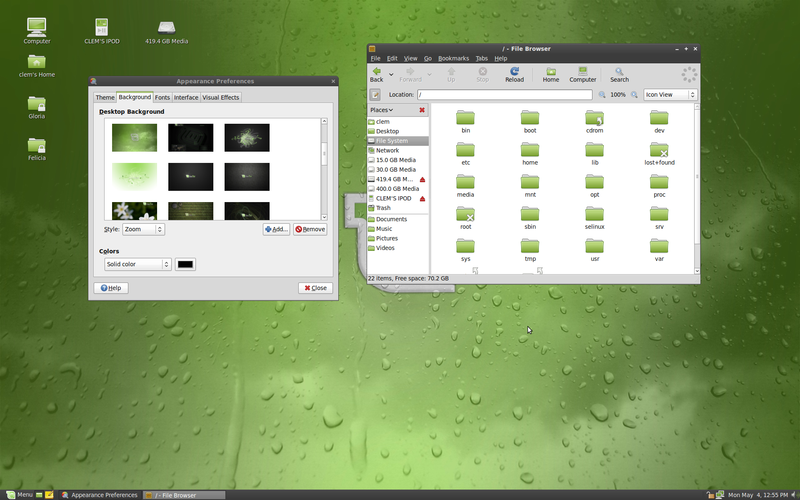 Burn the ISO at low speed and enjoy testing Linux Mint 7 x64 RC1. The upgrade path from Linux Mint 6 x64 will be finalized for the stable release. Please report any bug you may find via the Linux Mint 7 x64 RC1 Bug Thread and give us your feedback on this release by posting a comment right here on the blog. Can I upgrade from x64 RC1 to final version via update? You’re still working, I see. 🙂 Congratulations! Can we expect a comparison benchmark between the 32-bit and the 64-bit Gloria editions? It would be nice to know if there are performance differences because more and more people have 64-bit processors and these platforms get more mature over time. BIG THANKS!!! I wait a long time for this…. I agree with kneekoo. A benchmark comparison would be very very useful. Wonderful! I love your distro, but have been spoiled by the speed of 64-bit Ubuntu compared to 32-bit Mint. This is the best of both worlds! Mark, they already had Linux Mint 6 in 64 bit versions… I’m using it and it’s pretty stable and it has the same good things we love about Mint (32 bit, I mean). Thanks Clem! 64-bit is the only way to go and should be released BEFORE 32-bit! FANTASTIC DISTRO!!! agree on releasing 64-bit first… 32-bit is old hat and is now for legacy systems… you guy’s are great!… cheers!!! Thank you so much. I have been waiting for this since the release of the 32-bit RC1. Cannot wait ’til the final is out. While benchmarks would be nice, in general performance benefits will be minimal for most desktop apps. The 64bit version will show it’s best in activities that involve a lot of CPU number-crunching, so heavy (production) multimedia creation, and some scientific apps will show improvement. In my experience, the “performance” of 64 bit vs 32 bit for a desktop has been minimal. I’m trying to decide between the 32bit and 64bit to replace my aging openSUSE 11.1 desktop. I’m running Mint 7 on my MSI Wind and liking it a lot. I’m planning on using it as my desktop OS-while I’m testing the next release of openSUSE (sorry, Mint is great (I call it “Ubuntu done right!”), but I’m not a convert… 🙂 ). Awesome, I’ve been looking forward to this it’s like xmas in june. I’m also interested in testing but I too would like to know if there will be an upgrade path offered from mint 7 x64 rc1 to upgrade to mint 7 x64 stable? Or should I wait? Just installed the 64-bit version on my computer for the first time. Wondering about a weird little kernel issue at boot. In the GRUB, it has two kernel options: 2.6.28-12 and 2.6.28-11. It’s set by default to boot from the first, but when attempting to it ends in a black screen with flashing cursor and nothing else. Booting from -11 works just fine. Wondering if there’s some obvious reason for this? Or would it be hardware-related? Thanks for all the effort you guys/(girls?) put into this. I love the mint concept and the green theme. I was using Mint 6 x64. It was good, but too many crashes, mainly with firefox every 4-5 hrs or when inactive, led me to try Mint 7 x86 which for me was bit more stable, still having firefox crashes, and a hard crash today, but was noticeably slower on everything, even opening programs, on my new phenom 2 triple core. Hopefully, I’ll be upgrading tonight! Woooooooooooooooohooooooooooooo!!!!!! I’ve been waiting for the x64 ever since Gloria was still released. Great job guys! 64-BIT! WAY BETTER THAN 32! I USE INTENSIVE APPS! GREAT WORK! Great to see the 64 bit version so soon after the main release. I realize it is only a rc but its better then nothing! Thanks! Okay. I’ll remove that option from GRUB then. Could be because I didn’t have the installer format the partition, although it was from Mint Main edition I was installing over, so I don’t quite see the link there. Just installed MInt 7 64bit running well on system with 4 gig mem and 1TB HDD. But I was previously installing the 32 bit onto my system and it wouldnt run, I couldnt get the Keyboard or the mouse to work (I tried everything from usb PROBS TO hAL.). I was installing the system to 1 hard drive and the boot loader was on my boot up drive. when I formatted everything on a single drive (my boot drive) and ran the system totally from one Hdd THE SYSTEM STARTED NO PROBS. and the Keyboard/mouse problem disappeared. go figure, maybe this is one of the problems people have been missing when faced with this Keyboard/Mouse problem and that the system should be installed and booted from the 1st partition. I actually downloaded it a few days ago. Everything works *perfectly* on a Dell Studio 15 laptop, even the ATI driver which has given me fits with other distros. I can’t find a single hiccup, and I’ve been trying! Excuse me, I used Cassandra once, but it was quite long time ago. At time, my HDD broken, and now I’m returning to the ‘other OS’. Btw, I’m sorry if this is a stupid question, but can I use normal 32-bit apps in this x64 Release? I have a Pentium D that is said to have sort of 64-bit technology in it, so I hope I can optimise my CPU by using 64-bit version of mint, without losing in touch with many application written for 32-bit version. Woot!….just got back from Yosemite to this pleasant surprise!! Way to go Mint team! Been using live cd of Mint7-x32… will definitely install Mint7-x64 upon final release. Everyone’s right, x64 is probably the most useful platform and should be considered the PRIMARY edition. Way to go Mint team, way to go!!! I don’t go for 64-bit edition. The Main is enough for me. Any way congratulations for this team effort ! Works beautifully, kudos & thanks to all the people contributing into making Mint distro No. 1 :)! Sorry to ask such a question with all this good news.. but will there be a 64bit mint kde this time around? Great news, thanks. deluge is running. I’ve died and gone to heaven! But I’m never satisfied! Will there ever be a Mint Netbook remix? I was just about to install 32-bit Gloria, but will wait until 64-bit goes final. I’m running Jaunty 64-bit right now. OHH YEAH!!! its 9.04 mint style finally compability meets ext4 i cant wait to try this the core ubuntu 9.04 was lightning fast but the wireless driver support and wine loader was really something to feel dissapointed in. I too would love to see a Mint netbook remix. And support for RAID in the x64 version. AWSOME!!! For the issues I had with Mint 7 32bit on my machine, they are gone. I have been running this all week now and not a simgle problem! I found my new home! Great work ya’ll! I installed Mint 7 (32 bit) on one partition and then Mint 7 (64 bit version) on another partition. Mint 7 worked fine until I installed the 64 bit version then the Grub menu just forgot about the previous 2 “ext 4” distributions I had installed (Ubuntu 9.04 and Mint 7). I worked around this by booting onto a live CD that was able to locate each partition and then opened the partition containing the last complete working grub menu.lst before the 64 bit install. I then saved it to a USB stick so that I could paste the two missing ext 4 selections back into the grub menu. The mozilla firefox is so damn slow man on this release….fix it please..
Been using the live cd on my dell studio 17 for a few days now trying to find something to crash or not work but alas, no. Everything running sweet as a nut and noticabley faster than 32bit. A KDE version of MINT 7 64bit would be perfect. With all GNOME distributions i face an annoying issue on playing back video files. Anyway, great job and thank you! All runs well except can’t get Sound to work! Would Mint7(64bit) possibly solve this problem? Mint is such a great OS, well done guys! Hi, I’m new here, now I can install LinuxMint 7 64bit RC1. I have problem with sound when playing video. Any software is not working. Mp3 sound is in order. In Ubuntu this is not a problem. Have it working since the 10th. Great, faster than the 32. And there are till now, people loading it down via torrent. Same for the main edition. I let deluge seeding till there isn’t any body. Thank you…atm using 32bit….Cant wait until final 64bit relase. Good work guys. I was using ubuntu before, but thinks Mint is easier for a nabb cake of a noob linux user. Keep up the good work! Please Linux mint don’t need Netbook Remix edition,Moblin Linux will dominate in netbooks no reason for that.Linux mint should pay more attention on 64-bit platform.Cmon who needs 32-bit?Mintinstall on 64 should also be more updated with latest packages. I spread the word about mint to all my friend all uses 64-bit platform,ubuntu have some issues in 64-bit edition and mint can take advantage on this issues.I hope the best for you and this distro! I have athlon x2 running on 2gb ram, is this config idle for a 64 bit version of linux mint? i have not permanently installed on the system, stil running the live version. someone please advice.